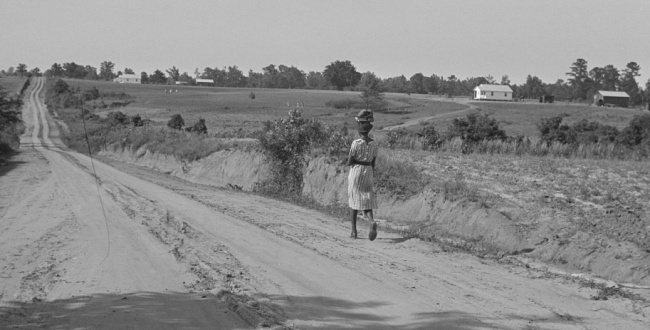 The Flint River Farms Resettlement Community in Macon County, named for the Flint River, which flows nearby, was one of several experimental planned communities established in 1937, during the Great Depression, under U.S. president Franklin D. Roosevelt's New Deal. 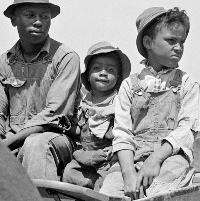 The community became home to 106 African American families, most of whom had previously lived on the surrounding plantations, where they worked as sharecroppers. During the summer of 2004 the Flint River Farms School Preservation Society was formed. 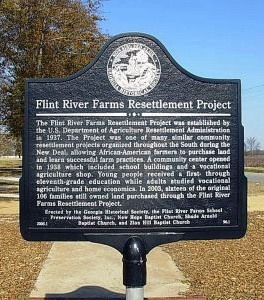 With the help of local residents, churches, and businesses, the group works to preserve the history of the Flint River Farms Resettlement Community and pays tribute to those who acted as pioneers at the community's founding. Twenty-five acres from the original school site, obtained in 2005 by a long-term lease from the local board of education, were transformed into a community park. That same year the Georgia Historical Society erected a historical marker at the site, where yearly events include Community Awareness Day, a classic car show, and a Christmas-tree lighting and caroling celebration. Flint River Farms began on approximately 11,000 acres of land, comprising 11 tracts from several large plantations purchased by the federal government. The land was subdivided into 107 farm units averaging 93 acres per unit. Two units were eventually combined, resulting in 106 units available for settlers. Each unit consisted of a new four- or five-room house, a barn, two mules, an outhouse, a chicken coop, and a smokehouse, along with bored wells, sanitary privies, and fencing. The Rural Electrification Administration installed electrical lines to each unit. The houses and farm buildings were constructed of wood on all but two of the units, where the buildings were constructed entirely of special rust-resistant steel, except for the doors and floors. The resettlement families were required to sign lease-purchase agreements. After a five-year trial period, successful farmers were offered forty-year mortgages at 3 percent interest to purchase the land. In 1943 the U.S. government first sold some of the farms to private owners, and by year's end almost half the units were sold. By 1945 nearly 90 percent of the units were sold, and the sales of the last two farm units occurred in 1948.